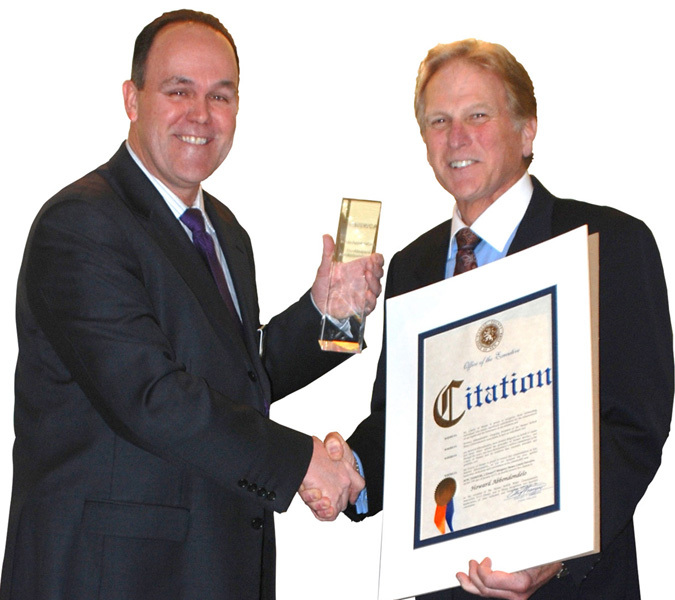 Former Nassau Suffolk Water Commissioners’ Association (NSWCA) President Howard Abbondondelo of the Albertson Water District was recently honored with two awards for meritorious service at a recent NSWCA meeting sponsored by the Plainview Water District. Mr. Abbondondelo was also awarded a plaque for “Outstanding individual achievement, leadership and selfless commitment on behalf of the citizens of Nassau County” which was presented by Nassau County Department of Public Work’ Assistant to Deputy Commissioner Brian Schneider on behalf of Nassau County Executive Ed Mangano. As NSWCA President, Commissioner Abbondondelo presided over the official NSWCA website and outreach initiatives, directed NSWCA’s successful Educational Seminars Program and led NSWCA’s participation in the Hurricane Preparedness Seminar held in mid-summer 2014. While currently serving as an Albertson Water District Commissioner, Mr. Abbondondelo will continue to be active in NSWCA.